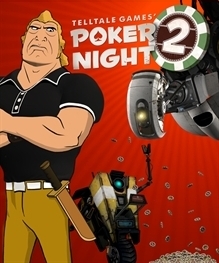 Poker Night 2 is the sequel to the casual poker game Poker Night at the Inventory. Like the previous game, it features crossovers from their previous titles (as well as characters from other games). It features Sam from Sam & Max, Ash from Evil Dead, Claptrap from Borderlands 2, Brock Samson from Venture Bros, and GLaDOS from Portal. It was released for Xbox 360 through Xbox Live Arcade on April 24, 2013, for Windows and Mac through Steam on April 26, 2013, and on PlayStation Network on April 30, 2013.